How beautiful is this sequin skirt from Lasula please?! It just screams party glam and I think that this outfit would be perfect for the summer and for holidays - I can just imagine sipping cocktails by the beach wearing this *dreamy eyes*. The skirt is such a statement I didn't think it needed much else - the simple tee and sandals compliment it perfectly without taking any attention away from it. Now that I feel holiday ready I feel the absolute need to search for my perfect summer holiday after writing this post - a perfect distraction from my endless amounts of revision *sob*. That skirt is absolutely stunning! Such a statement. Super glam! The little sun peaking out from the side of the skirt is such a cool look, way more individual than just a standard sparkly skirt. Gorgeous! Love the whole look you've put together. Holy moly!! That is the most amazing skirt! Completely in love! Good luck at the Cosmo awards, voted for you! That skirt is gorgeous! Such a unique pattern too! Such a lovely outfit and that skirt is so beautiful :) Love your flatforms too! I don't normally like "flatforms" but those ones look quite cute. Oooh, this skirt is so pretty!! You look gorgeous!! Love your skirt <3 amazing outfit, dear! What a beautiful skirt! I agree it is definitely a statement piece, and like how you paired it with just a white shirt! 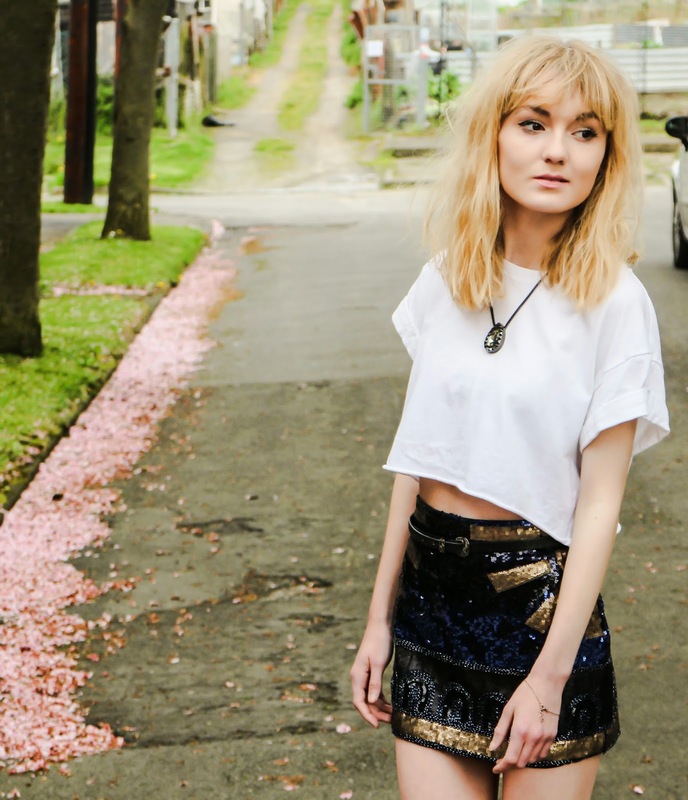 love the sequin skirt paired with this top! perfect look! Omg, I adore this outfit! That blouse is so elegant and fun at the same time!